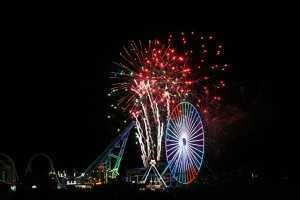 Friday Night Fireworks Returns to the Wildwoods Boardwalk! The Friday Night Fireworks will return to the Wildwoods Boardwalk for Summer 2018 on June 24th! Originally scheduled for Friday the 22nd, inclement weather has postponed them until Sunday. The Wildwoods Boardwalk invites everyone to come up to the Boardwalk early to enjoy the rides, shops and dining establishments before the Fireworks Spectacular at 10 pm! The Fireworks will be launched every Friday night at 10 pm from the Pine Avenue beach and will be visible from everywhere on the Wildwoods Boardwalk! The weekly Rain Date is Sunday at 10 pm.